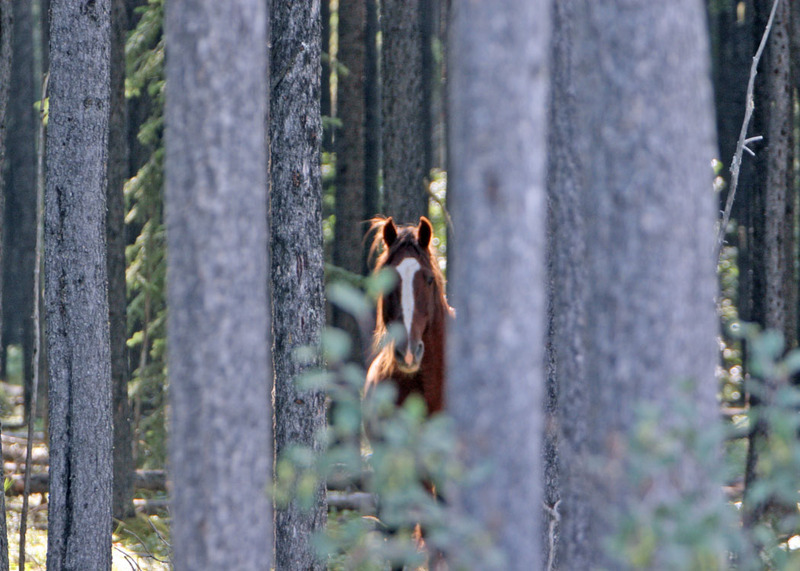 I have in past posts mentioned that in the heat of summer the wild horses can be harder to find, as they do what I call tree up. In doing this, they pick areas that have dense forest, good grazing close by and water. These locations are usually in isolated valleys and the muskeg bottoms. In doing so they also can, some what, escape the onslaught of annoying and biting insects and the heat of the high summer sun. 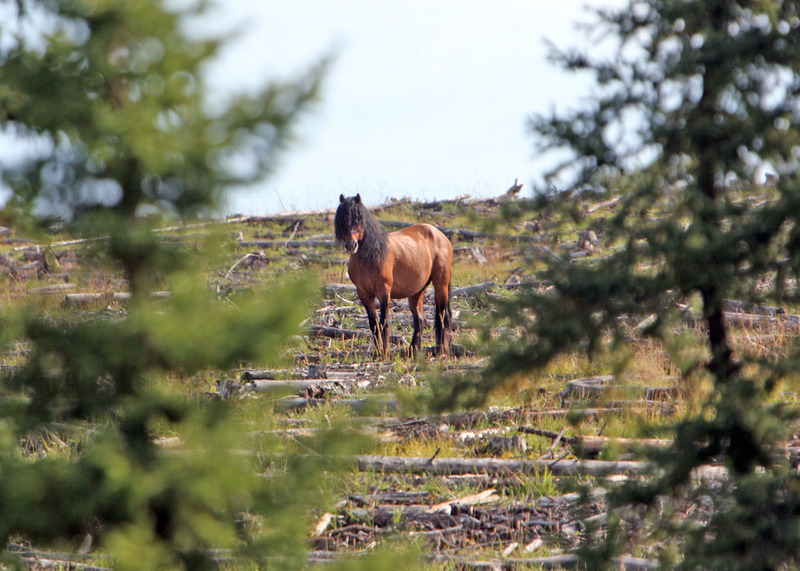 This year has not been as severe for heat or insects and therefore some of the herds have found the open clearcuts a place to graze. Here the wind will keep the insects at bay and also cool the horses. Still many herds out of instinct will continue to go into their summer havens. It was this past weekend that my friend Fran and I were out for the weekend riding our two young horses, Magnum and Whiskey. 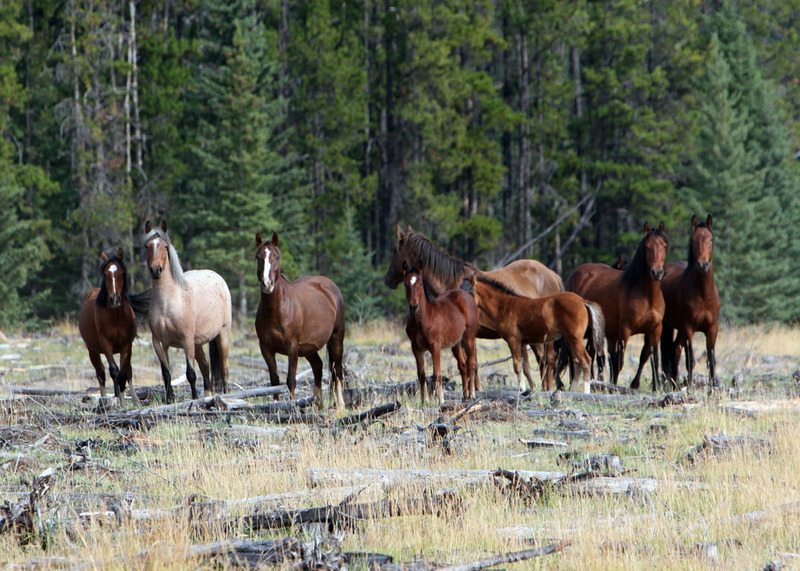 We were riding some of the trails west of Sundre, in an area I knew where to find some of the herds in order to check on them and take photographs. It has been a lot drier year in the west country than out here near Olds. Thus a lot of the marshy areas are drier and this make access on some trails easier. 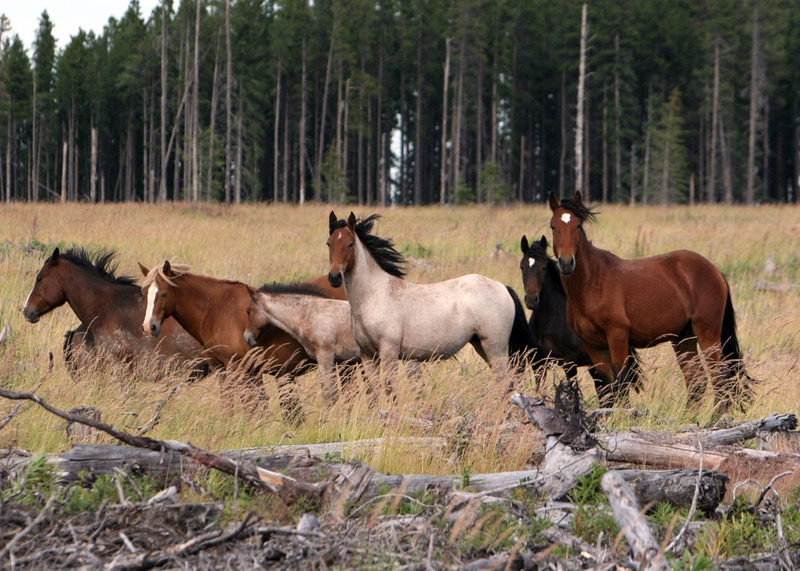 We had come across two herds and it was great to see that all the horses were strong and sleek. The foals from this year are growing rapidly and also looking fit and ready for the hardships of the seasons yet to come. 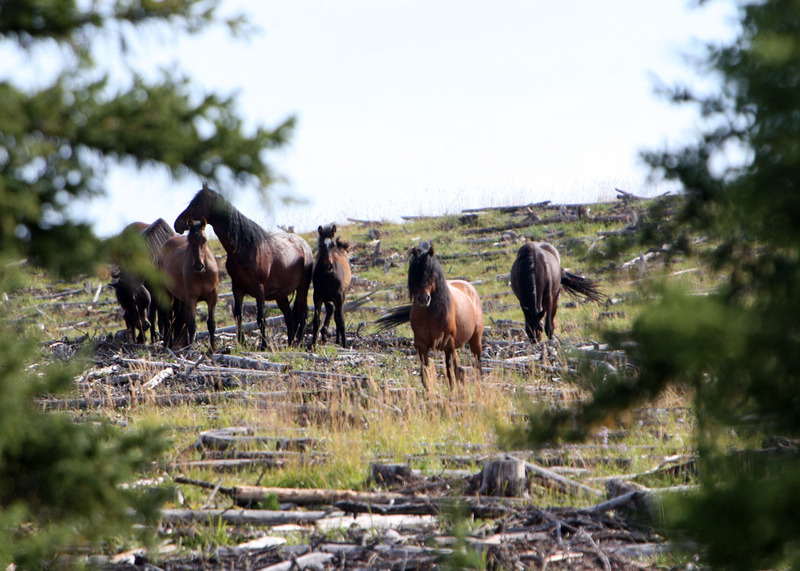 Over the years that I have travelled wild horse country on horseback or vehicle, I have often wondered where some of the herds I know find these summer havens. 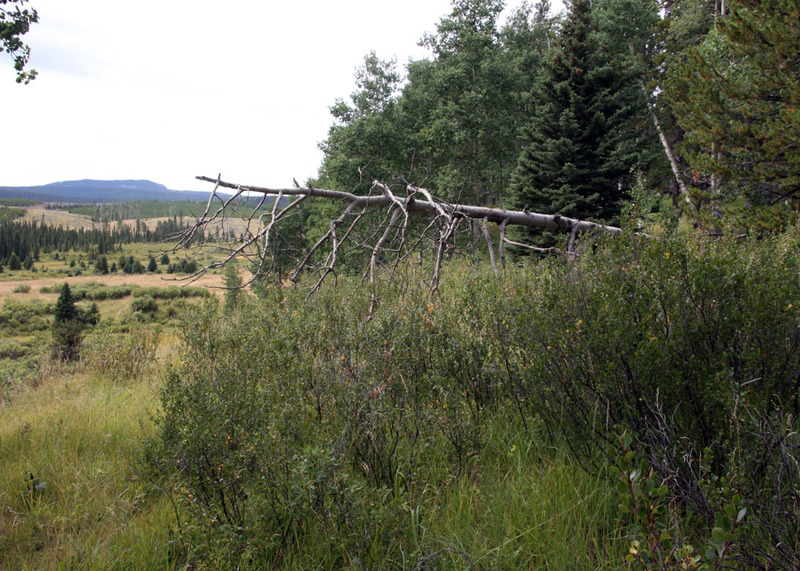 As we moved along one trail, Fran pointed out a well used horse trail that headed off through the thick pines. It was such a gorgeous day and we were in no hurry and going no place in particular. We decided to see where this trail may lead us. As we followed further into the trees other game and horse trails merged with it and it became a well worn, wide trail and just perfect to ride along. The amount of horse sign increased dramatically the further we got back into this one valley. 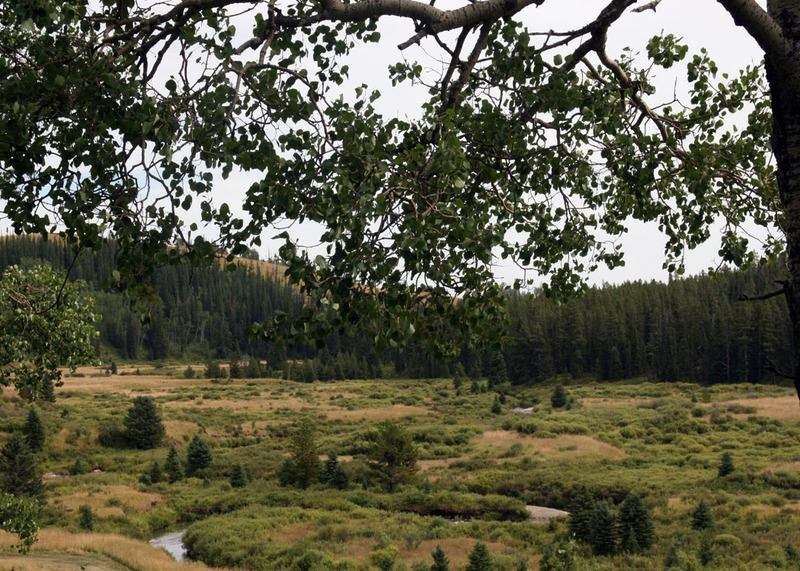 Then as we came out of the trees, we were in a beautiful meadow with a stream running through it. Ahead lay a vast muskeg area shimmering with the reflection of the summer sun on the long grass. The trail, as with most game trails skirted along the side of the meadow, just inside the tree line. We could tell that if it had been a normal year, we would have had difficulty, but because it was so dry we were able to carry on. Then rounding a bend, we spotted some horses in an opening. I dismounted and took out my camera to take some pictures. All of sudden my heart raced, for there standing looking at me was “The Ghost”. 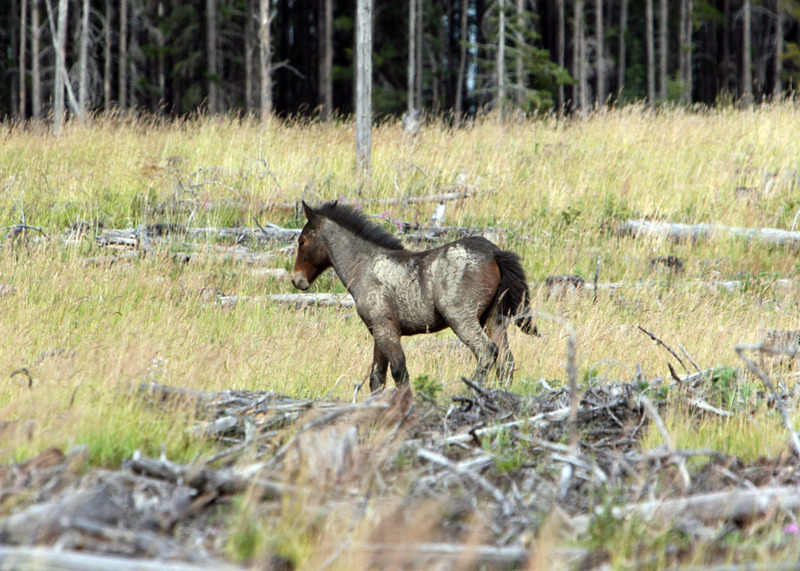 An elusive, large buckskin stallion, that I had always admired and usually only got glimpses of. He is a wise one, because all year he keeps his herd close to the muskegs and away from trail and roads where us humans can bother him. I was just elated at seeing an old friend and took many photographs before he snorted his warning, threw his head and then was off, chasing his herd in front of him and away to the safety of the pines. Back on horseback we followed the trail further back into the large valley until, on our horses we could go no further because of the muskeg. 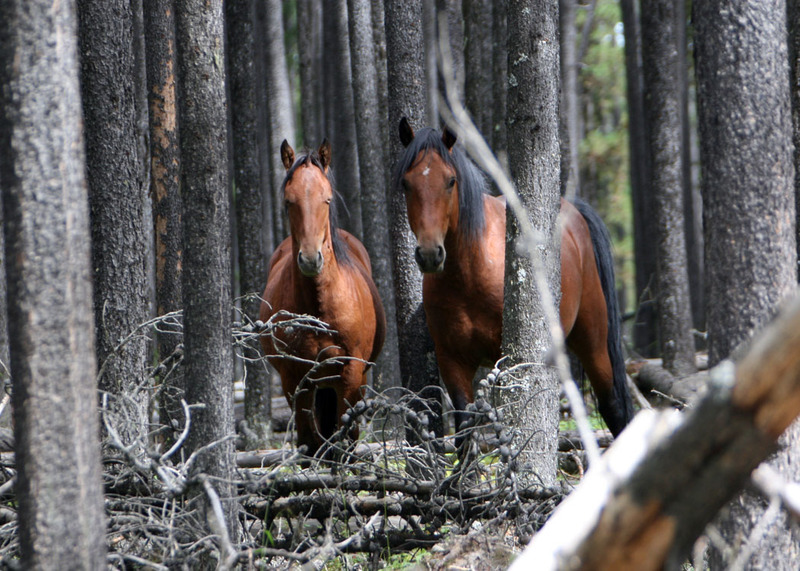 The wild horse trail kept going along the side of it and into the heavier trees. 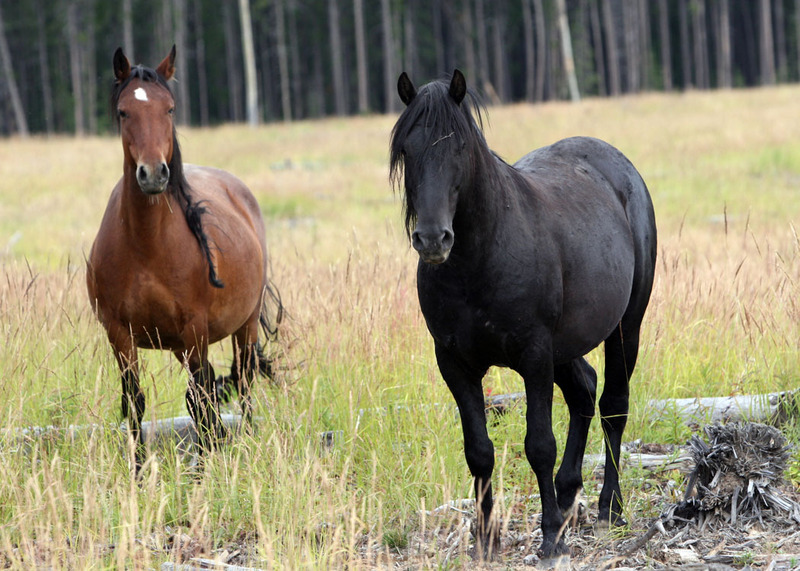 Adapted to their habitat, the wild horses have a much broader hoof and when they go through soft terrain, they do it at a good speed and lifting their legs high. Watching them move through this marshy ground it appears that they barely touch the ground as they quickly go over it. There were a good number of other horses in the valley and although I could not get a picture of him, here I also found “Scarface” with his herd. He was another stallion I knew well but had not seen in two years. What a day! Soon though the horses will adapt to their fall season routines as they prepare for the harshness of the winter yet to come. Before then though I plan a few more rides into “A Wild Horse Valley” to explore some more and to photograph the wild horses that inhabit it now. I can hardly wait to witness the beauty of this landscape and the wild horses that inhabit it, in the brilliant colors of fall. Just another note on the WHOAS 2012 annual fund raising calender, I hope to have these available by October 15, 2011. It will be in a 14 month format featuring a different picture and story line for each month. This follows the request of several of our supporters to have the previous December and January in following year included. We will also have these for sale at the Spruce Meadows Christmas fairs in November. Again thanks to all those who continue to support us and who write their letters of support to us. 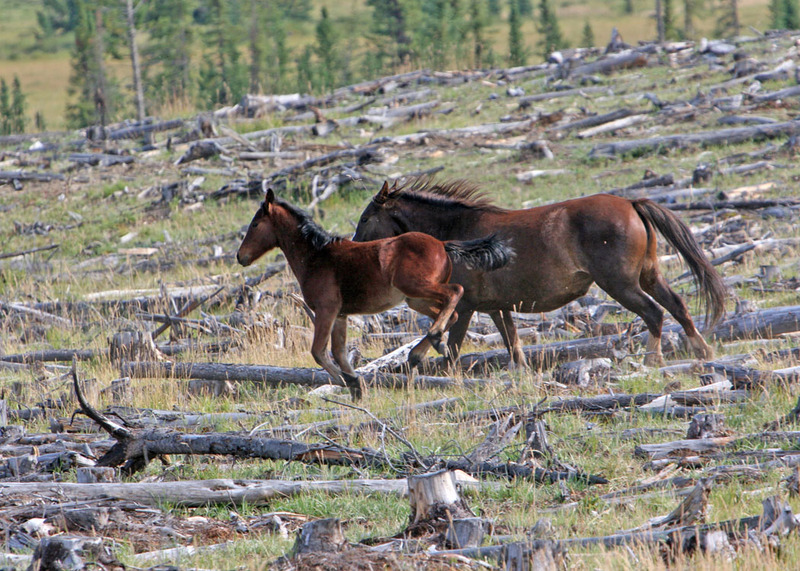 Without your support we could not carry on the work you want us to do in protecting your wild horses.